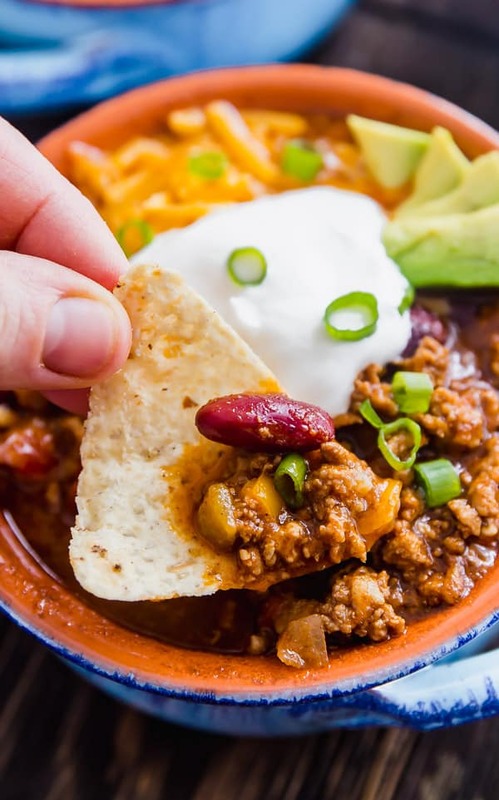 Easy Instant Pot Chili will knock your socks off. Ready in around 30 minutes and full of mouthwatering flavor! Now that I own an Instant Pot , I’m trying to use it a lot more. Because it’s so darn easy and totally quick! So I figured I better make some chili! So I came up with a killer Instant Pot Chili recipe to warm you up on the coldest of days. I especially love that it allows me the ability to develop a ton of great flavor in a reasonably short amount of time. This is because the Instant Pot gives you the ability to brown meat and saute in the very same pan that it pressure cooks in, which I think is just brilliant! I made sure to add a variety of chili seasoning options to make the flavor as robust as possible in such a short amount of time. This would be an excellent option for a game day gathering or a casual evening with friends. It’s also a super delicious weeknight meal. There’s really nothing like a good homemade chili recipe! Prepare your ingredients before starting to cook. This is called a Mise en Place and it’s something you should do before every recipe you prepare. Your overall cooking experience will run so much smoother if you do. Pay attention to how much Cayenne Pepper you add. I added an entire 1/4 teaspoon and it was reasonably spicy. To be honest, I was shocked that my girls ate it! You can easily cut this down to a pinch or leave it out entirely if a spicy chili recipe isn’t for you. Don’t worry about doing a natural release. While a natural release is more important for tougher cuts of meat like chuck roast, quick release works just fine for this recipe. A natural release certainly won’t hurt the recipe, so if you have the time you certainly can, but you can totally quick release it. Have fun with your toppings! 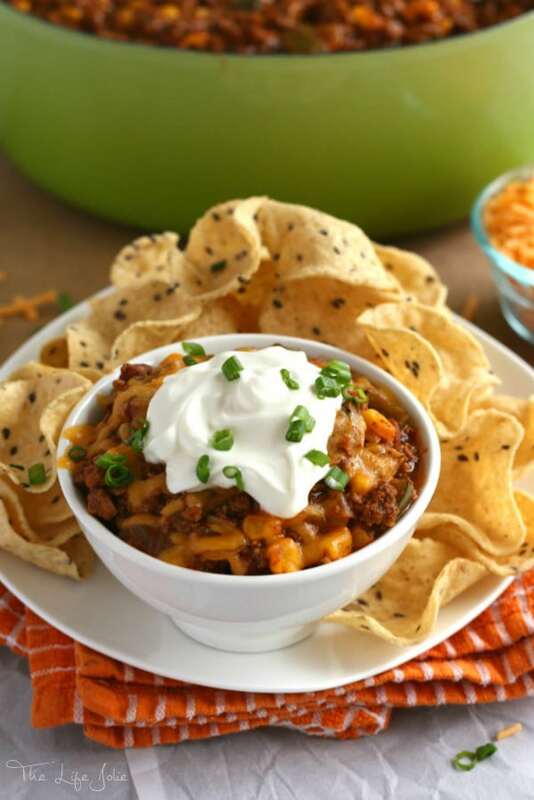 I love to add sour cream, tons of cheese, scallion and avocado onto my chili but you can really get crazy with the toppings- in fact that would be the perfect recipe for a make your own chili bar at a party! I even added some Mexican rice one night that I happened to have leftover in my fridge and it was such a delicious addition. And don’t forget some nice, crispy tortilla chip for dipping! Easy Instant Pot Chili will knock your socks off. Ready in less than an hour and full of mouthwatering flavor! Add oil to the Instant Pot and set it to the Saute setting. Add ground beef and ground pork to the pot and saute for 3-4 minutes to begin browning. Break it up, stirring frequently to ensure even browning. When the meat is halfway browned add bell pepper, onion, and garlic and saute for 2 more minutes stirring frequently until the meat is fully browned and the vegetables have softened slightly. Add the rest of the ingredients (except for the toppings) and stir well to combine. Press Cancel and secure the cover of the Instant Pot to a closed and locked position. Turn the vent to the pressurizing position and set the Instant Pot to Manual High Pressure for 12 minutes. Once it's done cooking, carefully do a quick release (always turn the vent away from you, I like to use a towel). Give the chili a quick stir and serve immediately with your desired toppings. This will last for up to 4-5 days in the refrigerator and freezes well. 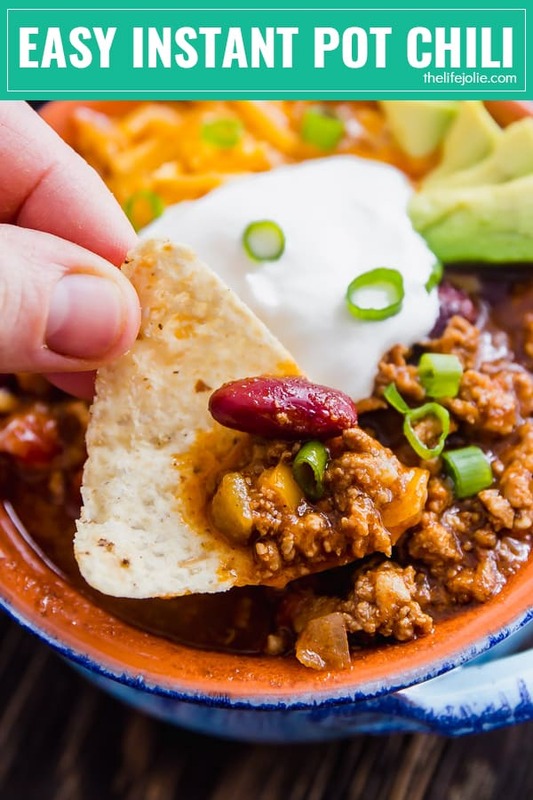 March 19, 2018 at 9:59 pm Chili is great all year round - love your recipe! March 21, 2018 at 10:17 pm Thanks Debra- and I agree- I'd eat it any day of the week 365 days a year! March 21, 2018 at 2:08 pm What a great idea! I need to get one of these instant pots! March 21, 2018 at 10:20 pm Thank you Meg- I resisted the Instant Pot for a long time but now that I have it, I live for it. The other day I had a super long shoot day and was SO tired. My husband was dying for beef stroganoff which I used to only do in the crockpot. Thank goodness for my instant pot because I was able to make the fall-apart-tender beef that he wanted in under an hour (most of which was inactive cooking time for me!). Total lifesaver. March 23, 2018 at 9:36 pm Such a wonderful combo, looks so spicy and healthy! March 24, 2018 at 4:51 pm Thanks Richa!